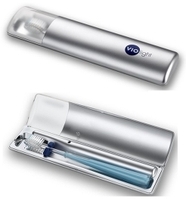 This Travel Bar Set comes equipped with all the necessary ingredients you would need to get a drink on the GO! Two martini glasses, a strainer, a stainless shaker, jigger, tongs, a martini spray bottle, two cotton napkins and a stainless combo fork/stirrer. 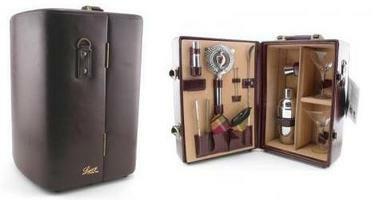 The premium leatherette cocktail case is made of mahogany with a tan lining, it has a Velvet interior and a removable leatherette carry strap. Important Notice: Liquor Not Included.